Many women love wearing jewelry to beautify their looks, including me. I’ve already got some jewelry items like rings, necklaces, and bracelets but I still dreamed to have my own custom-made jewelry piece for quite long time. 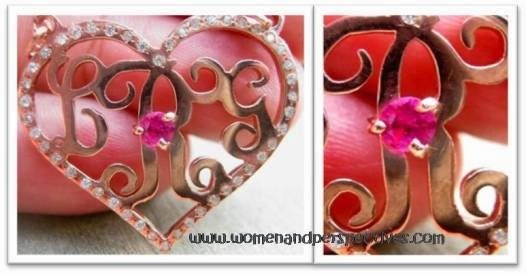 In my opinion, the best way to personalize jewelry is to create a jewelry item based on a person’s name or the initials of the full name. Yep, we’re talking about name jewelry or monogram jewelry here. Whether the jewelry is for you or as a gift to your close ones; they would be something unique and special. So, when NameStylish, an online shop that offers quality name jewelry and monogram jewelry at reasonable prices, contacted me last month for a cooperation plan, I was so excited. They permitted me to choose for free a jewelry design of their collection -in a certain price range- which I’d like to create and as the feedback, I’ll write my sincere opinion about the finished product once I get it. Both name jewelry and monogram jewelry at NameStylish.com are available in a wide range of elegant necklaces, rings, earrings, and bracelets that skillfully made from solid gold, gold plated, or sterling silver. Once you visit the store, you’ll see a wonderful collection of chic jewelry designs with name or initials on it. I’m not comfortable enough to let other people know my name easily, so I prefer to monogram jewelry, especially their necklace collection. Well, the jewelry choice is also a matter of personality and style, right? My package arrived yesterday (Apr 10, 2015); it’s about a month ahead since my last contact via email with the store. I have no problem at all since it still suits the total processing and delivery time as mentioned at their Shipping and Delivery Service & Policy. The store offers free shipping service worldwide; you don’t need to worry about additional fees. The item was packaged securely in a styrofoam box so that my necklace came in safe and sound, moreover the item placed inside a lovely jewelry box. I noticed that the monogram pendant was made beautifully as I requested. 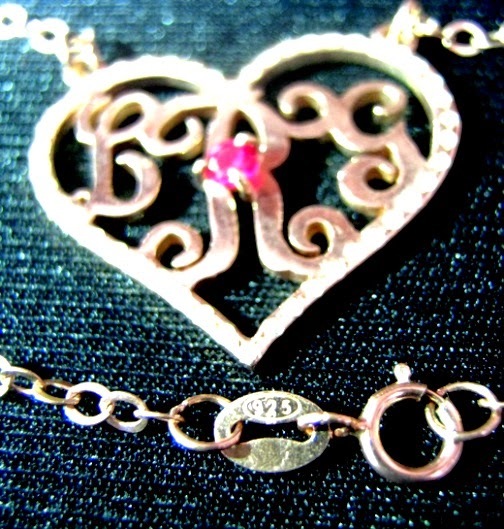 My new piece of personalized monogram necklace is named Heart Initial Monogram Necklace with Birthstone Rose Gold. I love the necklace design. -Based on the product description, the material of the monogram and the cable chain is 18K Rose Gold plated over 925 Sterling Silver. You can see the ‘925’ label near the necklace spring clasp. 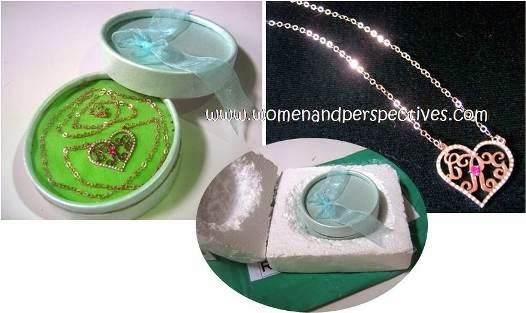 -The material has 1 mm thickness as the store promises; it makes a good quality and strong necklace. I choose this material since I haven’t yet got any Rose Gold jewelry before. The necklace is also available in yellow gold and silver, they are also wonderful pieces. -This monogram is unique because of its fine design. My birthstone –Garnet gemstone- placed in the middle and some white stones on the heart frame beautifies the pendant more. The necklace color suits the chosen material. Mine is lovely shade of Rose Gold. The current price of my necklace is $75.99. I choose the longest chain (22 inches). The price will be different -based on the preferred chain length, birthstone and added chain box. I think it’s a reasonable price for a custom-made product which has unique, personal, romantic, and exclusive values. You still obtain a good value of money. -There are five options to select. The shortest is 14” while the longest is 22” which I chose. 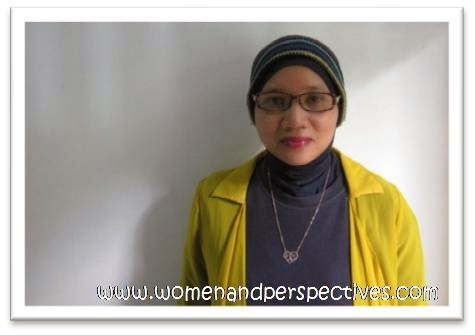 I prefer to wear longer necklaces since I’ve ever read an article mentioned that a round face like mine would look more oval when wearing a long necklace which frames the face. - I like this cable chain style. As long as the chain is simple and comfortable for my skin; I’m okay with any chain style. I think this monogram necklace can be used for different occasions. Its quality material and elegant well-created design makes it noticeable and charming. Simple cut and plain tops will enhance the necklace presence. They are small things yet important to join the necklace chain easily. I only hope to have a bigger one, as my fingers face small difficulty to open and connect the clasp into the joint ring. Besides the little trouble when connecting the necklace chain, I have nothing to complain. "I recommend this jewelry item based on its good Value, Quality, and Price". From one to five stars as the highest scores, I give four stars on each aspect. Do You Want Natural Longer and Thicker Eyelashes? Want to Get Healthier Fast? Follow This Guide! How does Beauty Benefit from Drinking More Water?